Locally-defined Hpa-an District corresponds roughly to the central region of Kayin State, comprising government-defined Hlaing Bwe Township. The region is bordered by Mon State to the west and encircled by rivers that eventually empty into the Gulf of Martaban at Mawlamyine. The Moei River marks Hpa-an’s eastern border with Thailand, north of Mae Sot, Myawaddy as far as its confluence with the Salween River and the Gyaing River forms part of the southern border. Hpa-an town on the banks of the Salween is the traditional capital of Kayin State with a population of around 50,000 people. In terms of the locallydefined Karen districts, Hpa-an is bordered by Papun to the north, Dooplaya to the south and Thaton to the west, divided into four locallydefined townships that do not appear on government maps: T’Nay Hsah, Htee Lone, Dtah Greh, Lu Pleh and Hlaing Bwe. Hpa-an District is sometimes colloquially referred to as Mo K’Nyaw Kaw, or ‘Mother Country’ in S’gaw Karen language. The evergreen-lined Dawna Rangespans the length of the district in the east, while the western and central parts of Hpa-an District consist of flatter agricultural land, punctuated with limestone cliffs and columns. 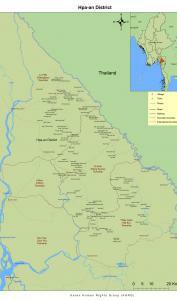 Previous KHRG reports have documentedthe proliferation of multiple armed groups and increasing militarisation of the district following the fall of KNU headquarters at Manerplaw in 1995.Hpa-an’s long eastern border with Thailand along the Moei River and southern border along the Myawaddy – Kawkareik vehicle road is marked by military camps and has been characterised by extensive landmine use, and the flow of refugees, for example to Mae La refugee camp or to temporary camps in the Tha Song Yang area. Most recently community members describe unbridled land confiscation, logging and mining by various armed actors, as well as planned hydropower projects that will dam the Salween, the longest free-flowing river in Southeast Asia, and destroy local livelihoods. The earliest KHRG reports from Hpa-an District describe living conditions in urban government-controlled areas, including systematic forced labour and extortive taxation of agricultural produce. In January 1995 the Tatmadaw began a major offensive against KNU (Karen National Union) headquarters situated in Manerplaw. By January 27th 1995 Manerplaw had been overrun and the headquarters taken. The speed with which the operation came to a close was in no small part due to a revolt by Buddhist members of the KNU under the authority of monk U Thuzana and the formation of ‘‘Democratic Karen Buddhist Organization’’ (DKBO). This split was stimulated at least in part by the KNU’s failure to incorporate Buddhist communities and a growing perception that the KNU was an exclusively Christian organisation. Joint operations by Tatmadaw troops and newlyformed DKBO columns, comprised of former KNLA soldiers who knew the area very well, led to the fall of KNU headquarters at Manerplaw in early 1995, prompting an influx of refugees to camps across the border in Thailand. After the taking of Manerplaw, the Tatmadaw launched sustained offensives throughout 1995 across Hpa-anDistrict to secure control of the region. A blockade on food and medical supplies to the district and the looting of villages by both DKBA and Tatmadaw troops sought to weaken the KNU’s position in ceasefire talks at the time. In 1996, forced labour and extortion was documented during the construction of roads, in order to facilitate ease of military access throughout the district. Forced labour was also reported in regard to logging, portering and the building of military camps which together, aswell as DKBA brutality, pre-cursored a steady stream of refugees leaving Hpa-an District for Thailand. In retaliation for KNLA raids into the central plains operating out of the Dawna Range,which spans the length of Hpa-an District and the eastern border with Thailand, the Tatmadaw attackedand burned villages lying on the western slope of the mountains. Some villagers fled east further into range. Villagers reported to KHRG that they were stuck in the middle of abuse that emanated from all military factions, including the Tatmadaw, KNLA and the DKBA, that all killed or confiscated livestock belonging to local villagers and extorted money from them. Compounding the situation, villagers suspected of helping a particular group risked summary execution or the destruction of their village as punishment. In 1998, fighting intensified between the Tatmadaw and DKBA controlling the western and central plains and the KNLA operating mainly in the Dawna Range and the areas east of it. KHRG reported villagers used as human shieldsduring KNLA attacks on government or DKBA troops and the use of landmines by all armed actors, including around farms, on pathways and in abandoned villages. Forced porters were used to walk ahead of military columns as mine detonators and groups of women were rounded up and used in the same manner, leading many villagers to flee their homes. At the same time, further north in Hpa-an District, Tatmadaw attacks on villages and displacement of villagers was being reported. Tatmadaw columns typically fired mortar shells into villageswithout warning from a hilltop position, causing villagers to flee. The troops then entered the village, looted the houses, killed and ate the livestock and burned down the houses and paddy storage barns. Villagers described at least four villages attacked in this way. KHRG reports after 2000 describe violations pursuant to Tatmadawattempts to establish controlover the contested area around Hlaing Bwe town.Forced labour was described during the constructionof army camps and roads. Villagers reported to KHRG that Tatmadaw troops demanded unpaid porters from villages, forcing them to carry rations, ammunition or other supplies up and down mountains to reach army bases. The porters were used to set up and supply new and existing army camps and to support troop movement. They were forced to carry loads weighing as much as 50 kilograms (110 pounds) and were often denied adequate food and drinking water. The informal ceasefire in January 2004allowed Tatmadaw troops in Hpa-an to strengthen theirpositions and build up weapon supplies, again resulting in mandatory conscription or extortion of money from villagers for non-compliance. Whilethe 2005 – 2008 offensive was ongoing in areas further north, villagers in Hpa-an District described severe impacts on their livelihoods and widespread food insecurity as a result of exploitative demands from local armed actors, land confiscation and forced labour. Increasing militarization also led to reports of the forced conscription of children, pulled from refugee camps in Thailand to join armed groups based over the border in Hpa-an District. In 2009, joint Tatmadaw and DKBA forces attacked a KNLA base and camp for internallydisplaced persons at Ler Bper Her, indiscriminately shelling the area and prompting 3,000 villagers to seek safety by crossing the border and staying at camps in the Tha Song Yang area of Thailand. Refugees staying in Tha Song Yang faced harassment by the Royal Thai Army soldiers, and villagers were forcibly repatriated to Burma between June 2009 and April 2010. Villagers returning to their homes faced the risk of landmines, conscription as forced laborers or porters, forced conscription into the DKBA as well as the possibility of punishments for being “insurgent supporters,” or used as human minesweepers by the Tatmadaw. In 2010, the refusal of some DKBA forces to transform to Tatmadaw Border Guard Force (BGF)battalions led to fighting that broke out in Myawaddy town during the November 7th 2010 elections. Prompted by the ensuing conflict between Tatmadaw and non-state armed groups, an estimated 20,000 people fled to neighbouring Thailand in the largest influx of refugees in 12 years. Throughout 2011, KHRG reported extensive human rights abuses toward villagers as a result of the ongoing fighting. Abuses included summary executions, arbitrary arrest and detention, torture, use of landmines and attacks against civilians and civilian objects. Increased military activity also resulted in additional abuses related not to armed conflict but to the extraction of goods and services from villagers via forced labour, arbitrary taxation and land confiscation. In February 2011, recentlytransformed BGFtroops defected back to the DKBA. June 2011 then saw sustained fighting between BGF and joint DKBA – KNLA troops in Lu Pleh Township, followed by the forcible relocation of eight villages to areas under Tatmadaw Border Guard control in July. Residents were given five days notice to evacuate, after which the area was indiscriminately shelled. During this period, villagers continued to perform forced labour in support of BGFcommanders’ commercial agriculture, logging and mining ventures. In September 2011, following the taking of a KNLA outpost in T’Nay Hsah Township, forced labour demands by BGF troops in the area increased dramatically. Reports from the same time alsonoted extensive planting of new landmines, impacting villager movement and causing civilian death and injury. Since the ceasefire agreement between the KNU and the Burmese government in January 2012, community members working with KHRG have taken interviews with multiple villagers affected by landmines in their area. This has affected villagers’ ability to graze livestock and find food. KHRG reported on September 26th 2011that Tatmadaw Border GuardBattalion #1017’s base was in Za Ya Phyu [village] beside Meh Breh village, T’Nay Hsah Township thatcommanderDih Dih was in charge of. BGF battalions #1017,#1019 and Burmese [Army]LID [Light Infantry Division] #22 joined together and, numbering 300 soldiers, attacked KNLA Battalion #101’s temporary camp in Kler Law Seh village. Later they attacked KNLA Battalion #101’s base onSeptember 21st 2011. At the end of the battle, they took overKNLA Battalion #101’s camp. The Tatmadaw has camps situated in Bpoo Lu Tu 1248 is LIB #549 under Camp Commander Thee Ha Aungand Gka Teh (Ta Lay) army camp. There are 25 soldiers in Bpoo Lu Tu and 45 soldiers in Gka Teh. BGF Battalion #1015 set up its headquarters in Yar Tah village in Dta Greh Township. BGF Battalion #1020 set up its headquarters in Gkoh Gkoh in T'Nay Hsah [Nabu] Township. T’Nay Hsah Township BGF Battalion #1017 Battalion Commander Dee Dee is based at S’ Yat Phyoo Camp. Villagers also face land confiscation in other areas of Hpa-an and for different reasons. KHRG reported on September 26th 2011BGF Battalion #1017 Commander Dih Dih summoned village heads to meet and ordered 100 villagers from M--- and G--- to harvest his corn and sow beans in Za Ya Phyu [Th'Ro Wah] village. Battalion Commander Dih Dih has been confiscating land belonging to Shan people [who live in Karen State] to sow beans. Tatamadaw soldiers from LIB [Light Infantry Battalion] #358 also took villagers' land in M--- and G--- villages to build their army camp. KHRG has also received reports of gold mining in the Hpa-an District. Battalion #1011, under Captain Pah Daw Boe and officer Pah Ta Gkee summoned Burmese area miners to mine for gold in the Meh Gka Taw River. The villagers have been engaged in this since January 2011 with machinery provided by private business interests. Heavy rain in August 2011 caused the Dta Greh River [Hlaing Bwe River] to burst its banks, flooding the area. Also due to the high levels of landmines throughout Hpa-an District, villagers face a situation where they are unable to graze livestock. The constant threat of landmines also stops villagers from being able to hunt and farm the area, adding to food insecurity. Villagers receive no medical aid from those military factions who force them to work, and should they step on a landmine during the course of the work they receive no transportation to medical care or financial assistance for treatment. This report discuss land confiscations, the acquisition of lands that are already occupied or used by indigenous communities, are on the upswing throughout Myanmar. 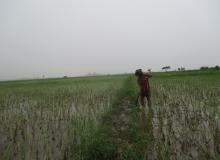 Current development practices in the country present a series of risks for the human rights of rural communities.